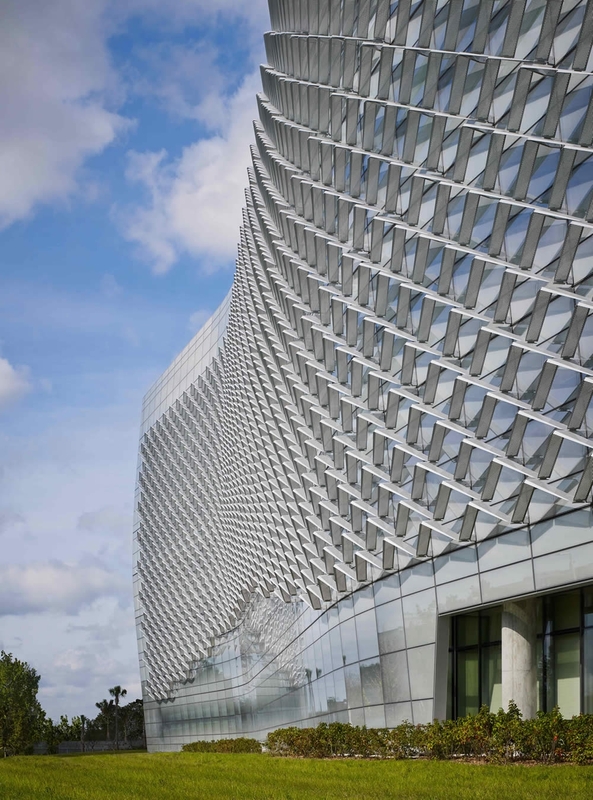 Jurors voiced unanimous admiration for the Federal Building’s geometric, textured sunscreens that were the subject of this detail award. 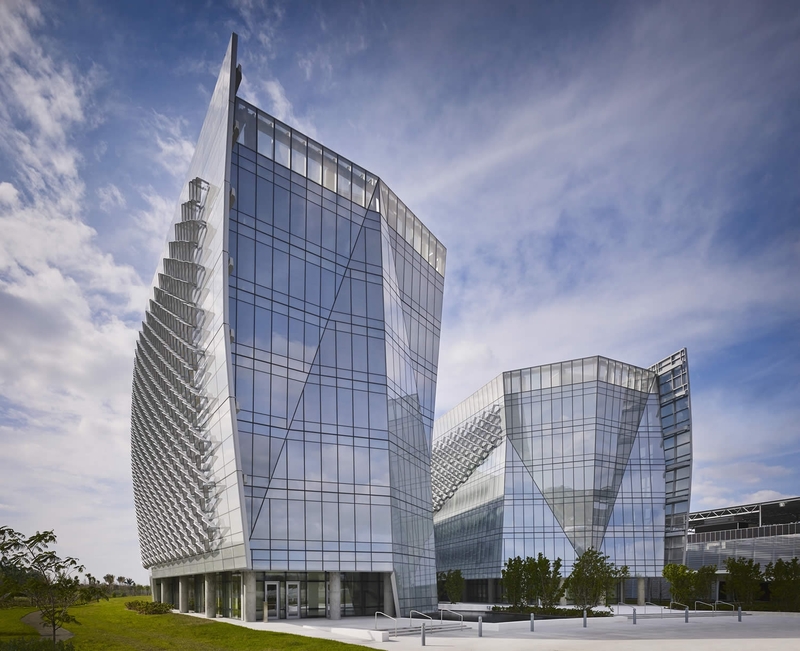 Built for two slender glass office towers for the Federal South Florida Headquarters where abundant daylight was desired, the tenants also experiences issues with glare thus necessitating sun screens. Manufactured from aluminum, the exterior solar shades were designed to manage the glare from the outside and also control solar radiation by preventing it from reaching the building enclosure. The unconventional inverted “V” shape, which mimics the path of the sun, blocks both the mid-day high solar altitude as well as the morning/evening low-angle sun. The shape creates a wide 90–inch-by-52-inch opening between each shade unit, allowing expansive views to the lush, indigenous wetland habitat that was restored around the building. The perforated blades were tuned to filter the appropriate level of sunlight for office space daylighting while simultaneously controlling glare. The perforation further allows them to become transparent when viewed from the interior. 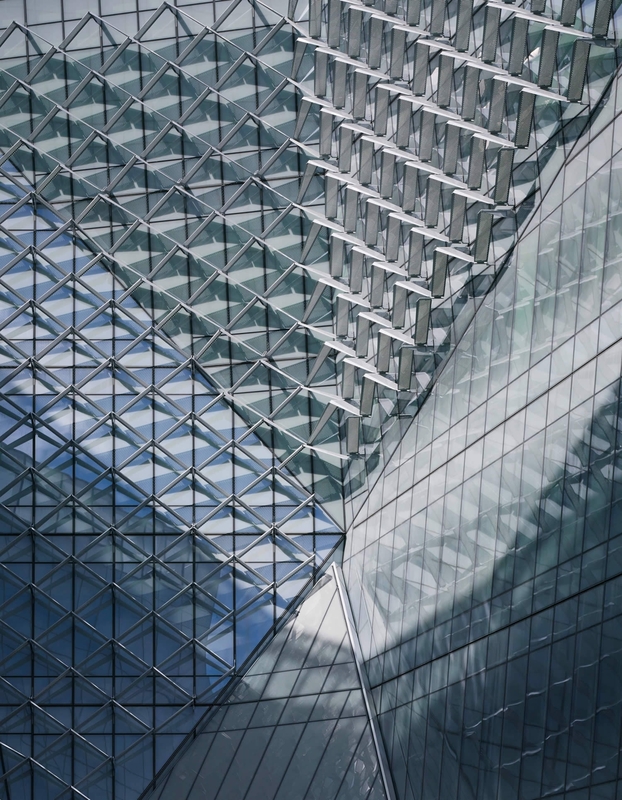 Designed to be a part of the unitized glazing system, the shade assembly allows a single chiral pair of blade geometry to effortlessly adapt to and follow along the changing building geometry. The connecting rod detail enables easy assembly and allows for the solar shade units to collapse into tight bundles for transport, reducing carbon footprint for manufacturing and transportation. The integrity, proportion and rigor of the detail emerged out of the building’s needs. It conveys dignity and utility, as well as “something one doesn’t always think of when it comes to federal buildings,” another juror joked. “If I saw that every day while going to work, I’d feel a sense of confidence. It’s incredible.